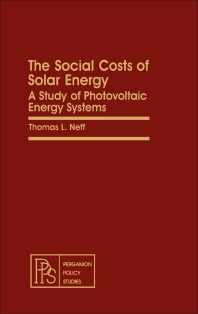 The Social Costs of Solar Energy: A Study of Photovoltaic Energy Systems covers issues of implementing a solar energy power source. Comprised of eight chapters, this book tackles several topics that are relevant to the use of solar energy as an alternative power source. The opening chapter is an introduction, which provides a review about solar energy. The succeeding chapters then cover the implications of implementing such technology, including the methodology, occupational risks, public health risks, environmental impacts, economic, and logistics challenges. This book will be of great interest to any readers concerned with the environmental, economic, and social repercussion of using solar energy.